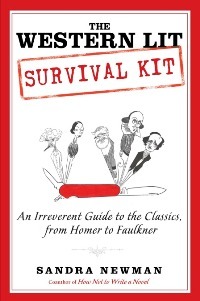 In The Western Lit Survivial Kit, author Sandra Newman seeks to shed a new light on the classics to prove they are less intimidating and more readable than you think. She argues that reading literature should be "emotionally satisfying, intellectually thrilling, and just plain fun." By providing a humorous guide that covers nearly every important work in the Western literary canon, Newman resurrects the classics you forgot you read in college and helps you remember why you studied them in the first place. Starting with classical literature, the Greeks and the Romans, and covering everything through the 20th century, Newman deconstructs the plots of important authors into concise summaries, so even if you never got around to reading Chaucer's Sir Gawain and the Green Knight, at least you've got a basic knowledge of its plot. What is great about this book is that it makes for a great refresher if it has been awhile since your undergraduate lit survey classe (as it has been for me). I feel like I have brushed up on many of the movements, their key players and what made each so significant. The book can also work as an introduction to the history of the classics and would certainly make a good supplement to any related courses. I know the chapter on Shakespeare would have helped me greatly in my Shakespearean Drama class, where we read a play a week for 15 weeks. When studying for my final, it was hard for me to keep all the historical plays in order. While this isn't the end all be all book when it comes to western lit, it certainly helps clarify some of the fuzziness. This book treats Western lit like an amusement park. It offers a guide to the rides, suggesting which ones are fun for all ages, which are impossibly dull for all ages, and which might take a lot out of you but offer an experience you simply can't get anywhere else. What I found especially helpful about this book is it's rating system. Newman conveniently rates each work by each author she cites by it's importance, accessibility and fun, making it easy to weed through the lesser important works in favor for the ones that are more worth your while. The book as a whole has motivated to tackle more classics. While their may not be any new information or profound opinions included in this guide, and though it's likely you'll roll your eyes at some of her jokes, Newman's fresh take on the classics is sure to inspire a non-classic reader to take a look at the works that set the precedent for future literature. I was provided a copy of this book by TLC Book Tours in exchange for my honest review. It's one of those books I'll go back and reference when I'm choosing classics to read. Oh I hope it does! The problem is we were forced to read so many of these books that we don't consider them for enjoyment now. This sounds like it would be a good book. Agreed. This sort of sheds a new light on them. I found a title similar to this in B&N the other day. It sounds like the perfect book for those that love to obsess over classics lists, and those looking for the perfect classic to be re/introduced to. The rating system sounds fun. Beth someone on twitter said they were having issues commenting on my blog... I think something is up with blogger. Sorry about that. I REALLY like the idea of a rating system based on the qualities you mentioned - I think that would help me find the classics that I'd be likely to love the most. Sounds interesting. There are a lot of books that I suspect have been ruined for me through having to write essays on them and which I would really love if I read them again. Though I defy anyone to make me love George Eliot.